AL HADJI YAHYA A.J.J. 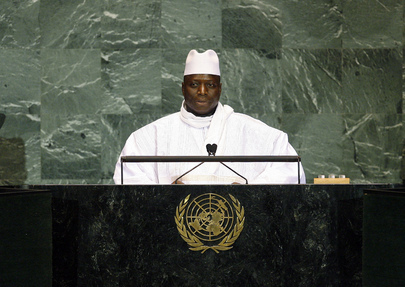 JAMMEH, President of Gambia, opened by noting that this year’s focus on strengthening multilateralism was particularly relevant. “The complexities of today’s world are such that no nation can successfully confront alone,” he said, adding that much could be achieved when countries collaborated and based their actions on mutual understanding, respect, commitment and universal justice. However, he said, some Member States blocked well-meaning resolutions necessary for the maintenance of world peace. As long as that continued to be the order of the day, he said, the United Nations would remain “united by name only”, and would not fully achieve its objectives. He called for urgent reforms within the United Nations systems, ones that would establish the principle of equality among nation-states, irrespective of their geopolitical size, location, or economic circumstance. He declared that double standards had no place in the United Nations. He also said there was nothing African countries could do because those “locusts” had absolute monopoly of the technologies being used in those extractive industries. He argued that treaties make it impossible to do anything about it -- and that these treaties are also called “globalization”. He asserted that, even dead bodies had not been spared by the locusts, referring to the price that agricultural products such as tea, coffee and cocoa fetched on the international markets. Indeed, Africans received only $1 of profit when a kilo of agricultural products was sold for $15 once it reached the international market. He reiterated his delegation’s support for the Global Fund to fight HIV/AIDS, malaria and tuberculosis, and called for concerted efforts to support international research on traditional medicine and alternative disease treatment programmes. In fact, he added, traditional systems were more cost-effective, but often abandoned for the sorts of criticisms that come from multinationals “who feel threatened that certain traditional breakthroughs would be detrimental to their corporate existence and interests”. Addressing peace and security, he favoured a speedy resolution of the plight of the Palestinians and called upon the State of Israel to accept and respect the two-State solution that the international community had so clearly articulated. In addition, his delegation held the position that Taiwan should be invited to participate in all the meetings and activities of the United Nations and its specialized agencies. Lastly, he expressed deep dismay at the protracted negotiations and a “seeming connivance to prevent the reform of the Security Council”. He said Africa wanted to see such reform undertaken with a balanced representation of the continents in the Security Council. He urged the President of the General Assembly to ensure that Africa had at least two permanent seats in the Council.